“There are many dead,” said the head of the Andria police department Riccardo Zingaro. “There was a head-on collision on a single-track and some of the carriages are completely crumpled. The rescuers are pulling people from the wreckage,” he added, as cited by La Repubblica. The incident took place near the city of Bari on Italy’s Adriatic coast, between the rural towns of Andria and Corato. Upon arriving at the site, the mayor of Corato Massimo Mazzilli said, "It looks like there has been a plane crash." Giuseppe Corrado, the deputy head of the local province, made an appeal for blood donors to go to local hospitals. "We are working with dozens of rescue teams to open up the carriages," said Luca Cari, a fire service spokesman. "The rescue is complicated because this happened in the middle of the countryside," he added. The trains came head to head on an area of single track. The line, which runs northwest of Bari in the ‘boot of Italy’ is busy, with over 200 trains using the line every day. Work had been taking place to add an extra line to ensure that trains would not possibly meet in the middle of the track. There are still a number of passengers trapped in the train carriages, with rescue workers working frantically to reach the injured. A child was pulled from the wreckage and was taken to hospital by air ambulance, Il Messagero reports. 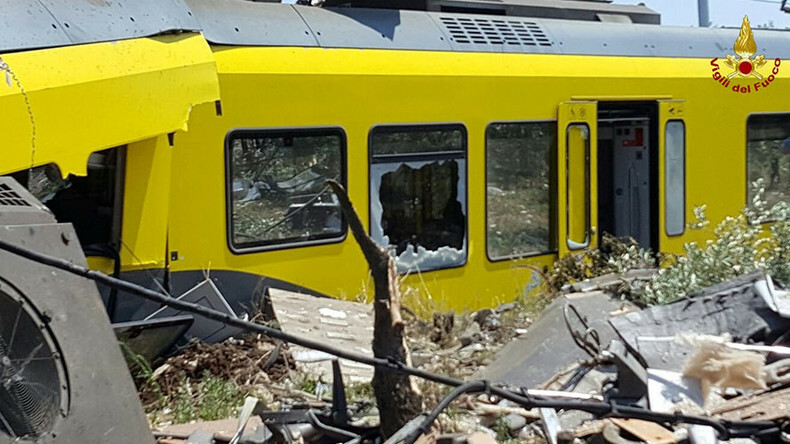 Italian Prime Minister Matteo Renzi has called the devastating train crash “a moment of tears” and pledged not to rest until the cause of the crash is determined. Renzi had been on a visit to the Museum of Science and Technology in Milan, where he addressed the families of the victims of the rail disaster, adding that he would return to Rome immediately. Eleven people were killed in Germany in February when two commuter trains collided on a single-track stretch located around 60 kilometers southeast of Munich. Dozens of people were injured in the head-on collision, which occurred when the trains were traveling at around 100 kilometers per hour. Local prosecutors said the crash was caused by human error. It is understood that a signal controller gave a special signal to one of the trains “which should not have been given,” causing the two trains to collide on a one-way track during morning rush-hour, Reuters reported.